Just four days later, race car driver A.J. Foyt would become the first driver to win the Indianapolis 500 four times. The Apple Computer would officially begin its rise to global fortune and fame while the Commodore company introduced the world to its first personal, all-in-one computer, the “Commodore PET”. Even rival automotive manufacturer Porsche was reaching new milestones with the introduction of their first front-engine, V8 powered car, the 928 at the Geneva Motor Show on September 28th. For Chevrolet, however, the 1977 model year marked a significant manufacturing milestone – the production of their 500,000th Corvette. 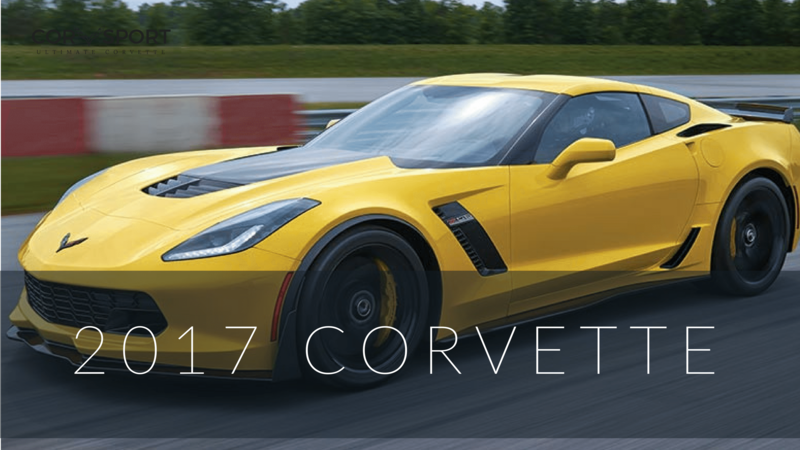 It had taken Chevrolet 15 years to build the first 250,000 Corvettes, but only an additional eight years to build 250,000 more. 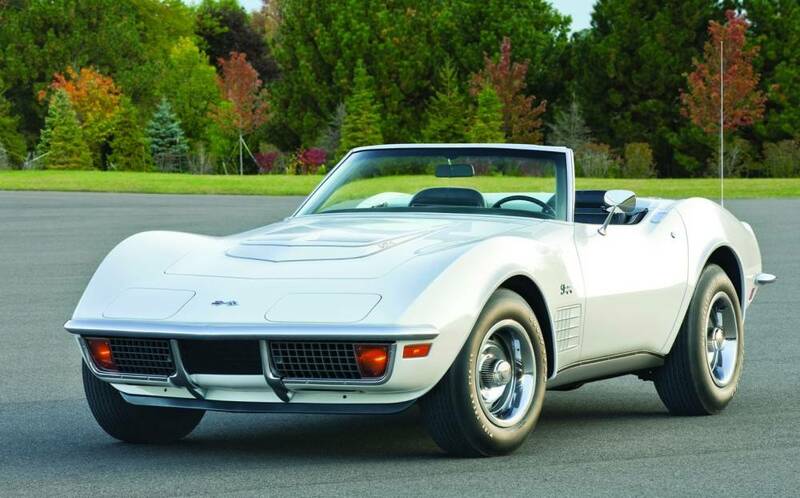 While the 250,000th Corvette had been a Riverside Gold convertible that had been built on November 7, 1969, the 500,000th Corvette was a white coupe, which was driven off the production line by (then) Chevrolet General Manager, Robert Lund on March 15, 1977. The 500,000th Corvette rolled off the production line on March 15, 1977. It can be seen today at the National Corvette Museum in Bowling Green, Kentucky. 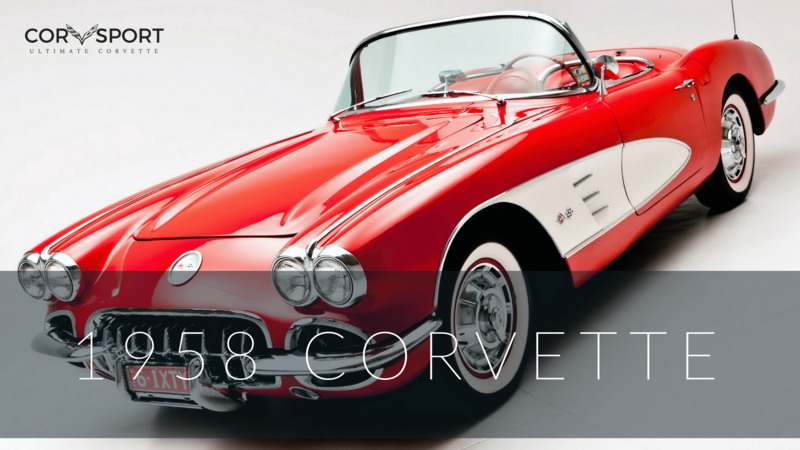 Ironically, the Corvette had nearly been pulled from Chevrolet’s lineup in those early years of its production, despite the prosperous post-war economy of America in the mid-1950’s. 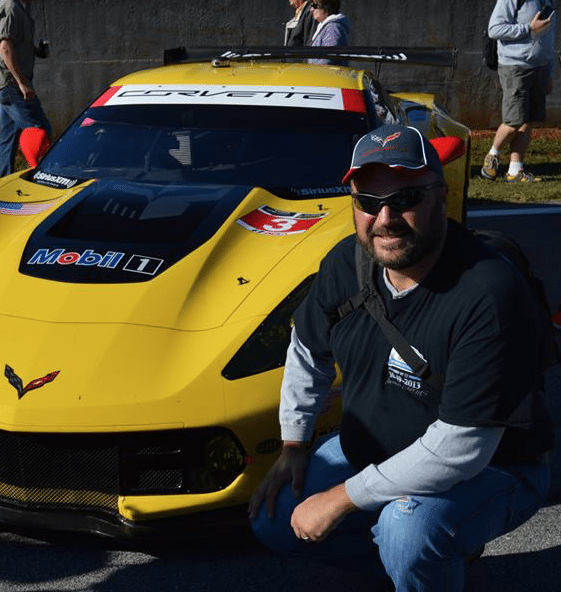 Adding to the irony was the fact that the Corvette had actually flourished throughout difficult economic times, even in periods when rival automotive manufacturers were pulling the performance-car models from their ranks. 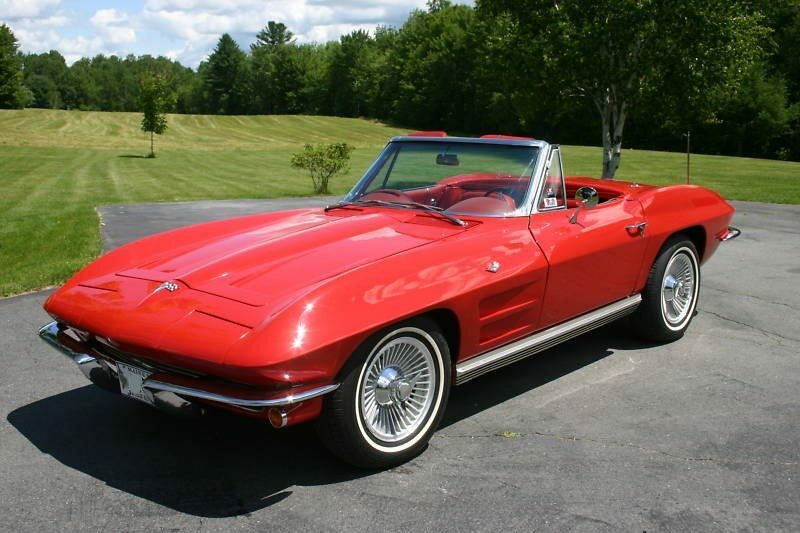 While it was true that the Corvette’s performance had certainly dwindled – especially over the past couple of years, to a modest shadow of its big-block older brothers from the 1960’s, there was no question that the car’s appeal had only grown with each passing year. DID YOU KNOW: The 500,000th Corvette, a white 1977 coupe, rolled off the St. Louis assembly line at 2:01 P.M. on March 15th, 1977. With regard to the T-tops, glass roof panels were introduced as a new option at the start of the model year, though General Motors later canceled the option because of a reputed dispute with the supplier over sales rights. 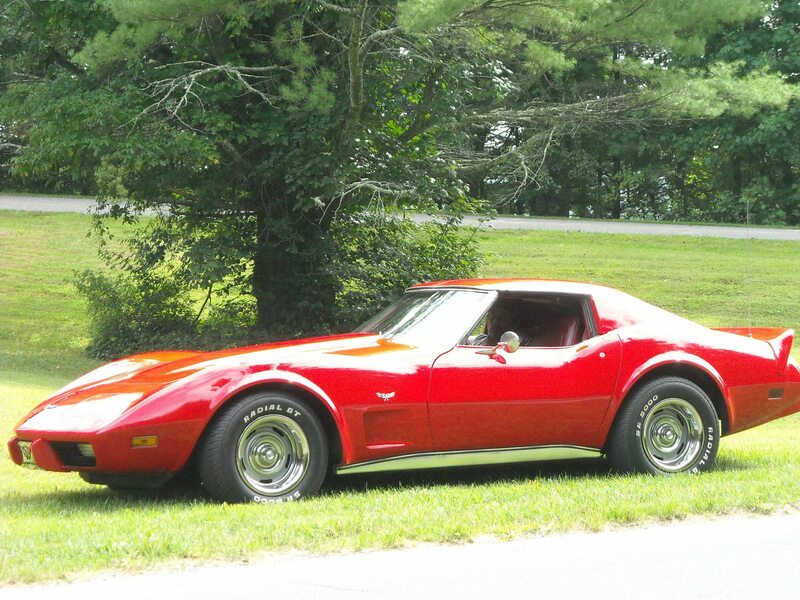 The most notable change from 1976 to 1977, however, was the removal of the Stingray nameplate from the Corvette’s front fenders. 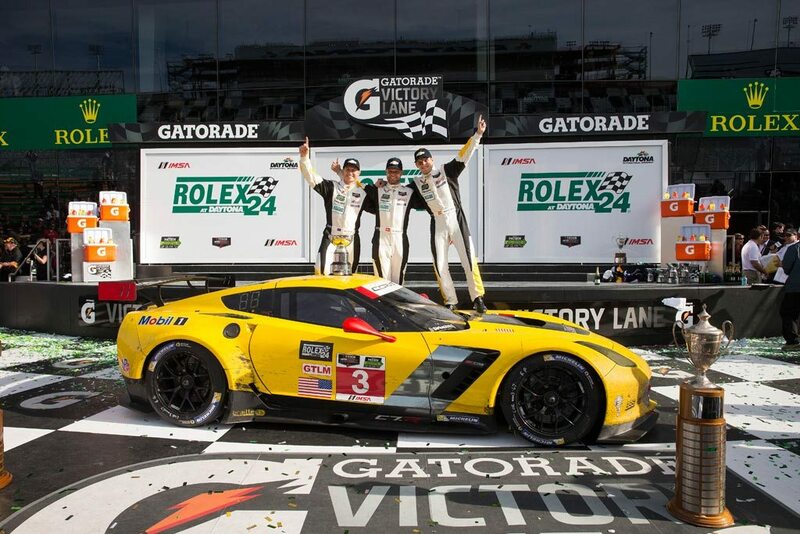 It was replaced by Corvette’s traditional crossed-flags insignia. 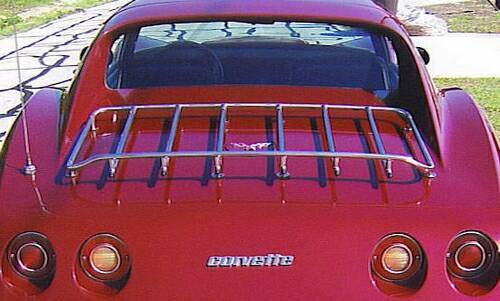 The 1977 Corvette featured a reworked luggage rack that could also carry the car’s T-top roof panels. 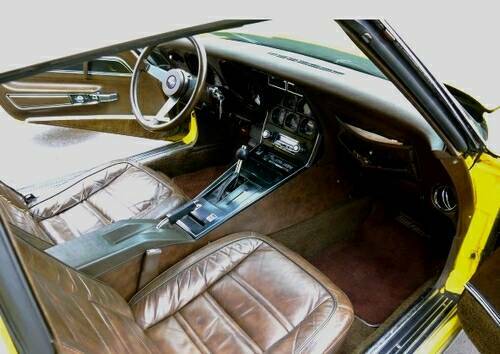 The interior of the 1977 Corvette featured a redesigned center console, an improved dashboard, and leather seats as a standard option. The changes to the interior were equally subtle, though there were a few more modifications worth noting. First, the interior center radio console was redesigned to accept a broader array of Delco audio decks (including an AM/FM/cassette stereo as a first-time option). The instruments on the dashboard were restyled to provide drivers greater visibility. The climate controls were simplified. Moving down the center column, the manual transmission lever was lengthened, placing the shifter ball higher up in relation to the disengaged handbrake. Previously, the shorter shifter shaft had caused interference when drivers attempted to actuate the parking brake lever. By lengthening the shifter lever, the parking brake accessibility was improved, making it easier to engage and disengage. 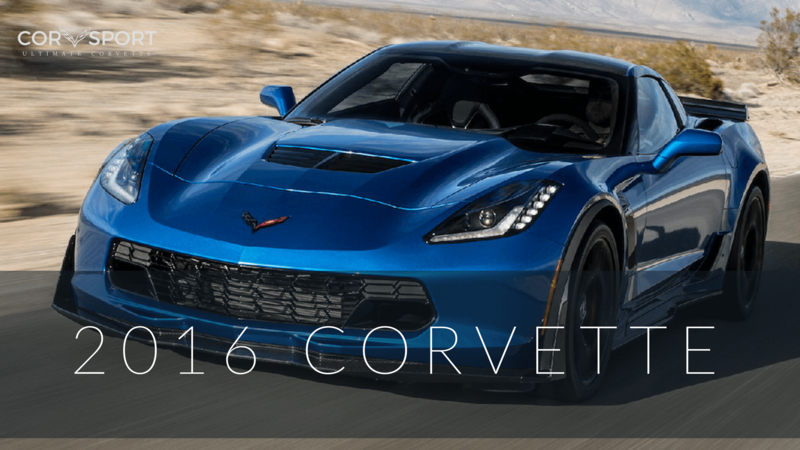 Additionally, the shorter steering column improved driver accessibility in-to, and out-of, the new Corvette. Mated to the steering column was a new leather rimmed steering wheel. For those consumers that ordered the optional tilt-telescopic steering column (RPO N37), the 1976 style steering wheel remained the only choice. 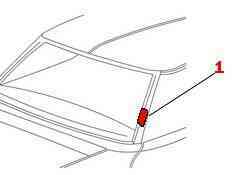 While tilt and telescopic adjustments remained optional, Chevrolet did introduce a new feature to the 1977 Corvette – namely the new “Smart Switch” – a steering column stalk that combined the headlight dimmer and wiper/washer functions with the turn signals. The alarm switch was moved again and was incorporated into the left door-lock button assembly. Additionally, the sun visors were revamped to allow them to swing from the windshield to the side windows. Even the mounting location of the rearview mirror was shifted from above the windshield to the windshield itself. 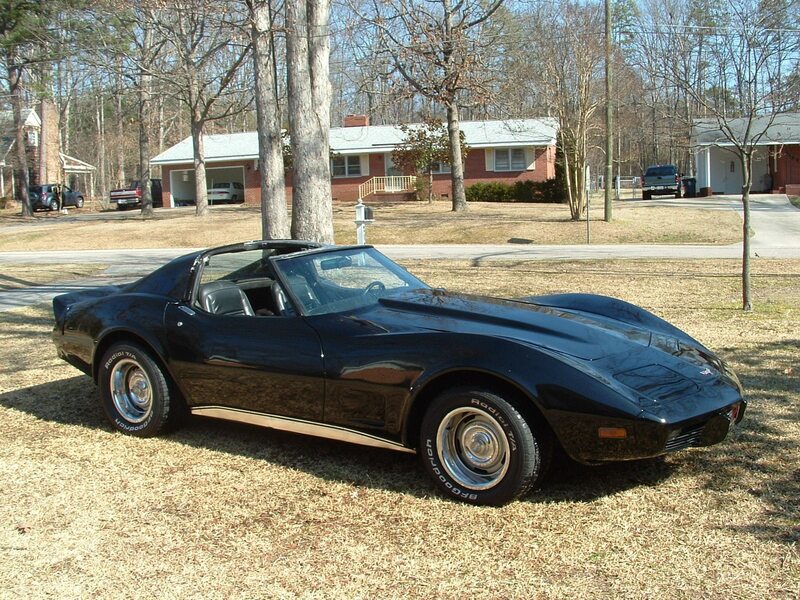 Lastly, for the 1977 model year leather upholstery came standard with the Corvette while cloth seats with leather bolsters were an optional no-cost alternative. 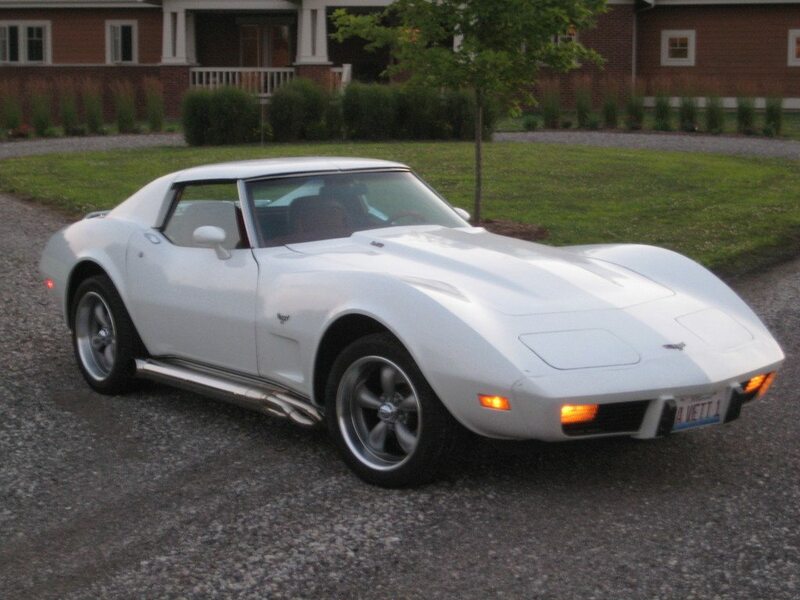 The 1977 Corvette featured two different engine “colors” based on when the engines were produced. Early production engines were orange, while later production engines were blue. 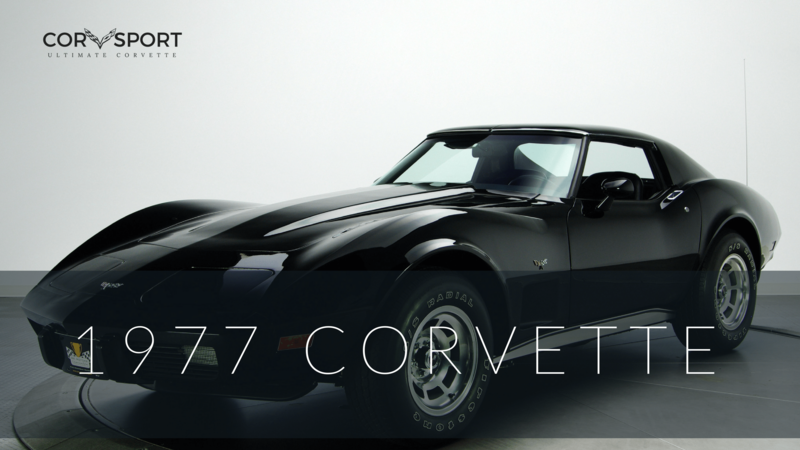 Mechanically, the 1977 Corvette went essentially unchanged from the 1976 model year. 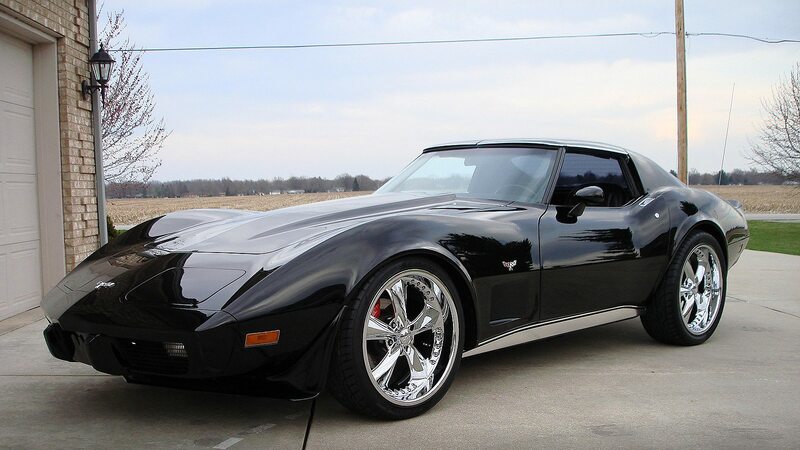 As in 1976, the 1977 Corvette came standard with a 180 horsepower, 350 cubic-inch, small-block Chevy engine mated to a 4-speed, wide-ratio manual transmission. 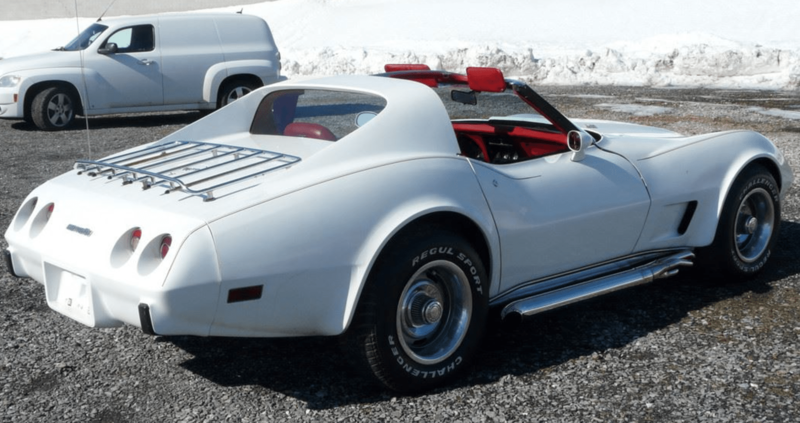 Also like the 1976 model, the new Corvette could be ordered with an optional 210 horsepower engine (PRO L48), except in Canada where the base engine remained the only available option due to higher emission standards. While the engines remained the same, there was an interesting turn of events within General Motors that occurred early in the 1977 model year’s production run. Between August 23 and September 7, 1976, Flint Engine (the plant where the small-block 350 was manufactured) began using blue paint in place of the traditional “Chevy Orange” paint that had normally been applied to Corvette engines. 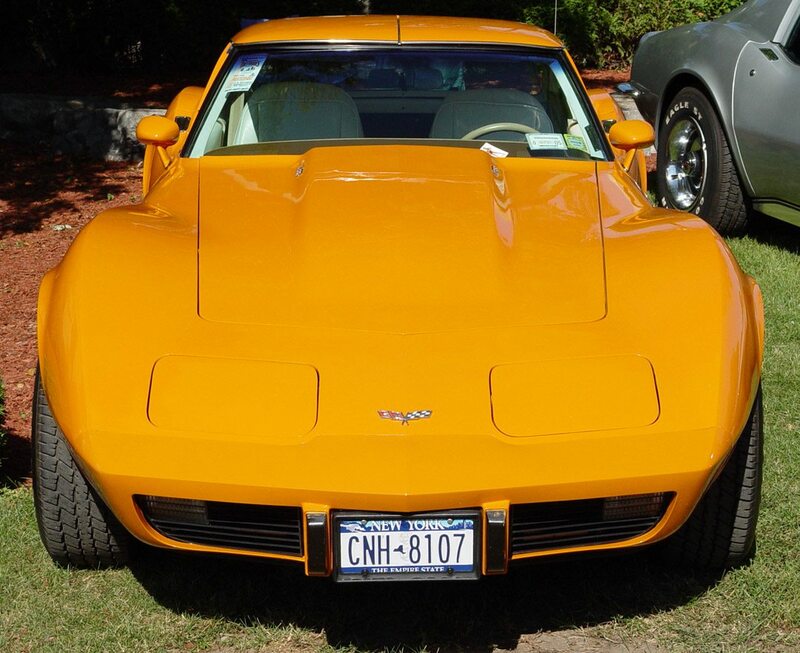 Thus, early 1977 model year Corvettes continued to feature the familiar orange, while later production engines were blue. 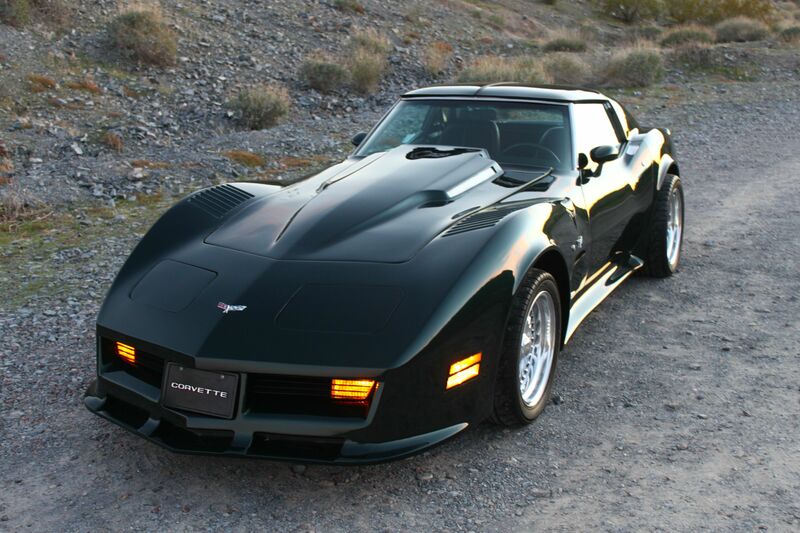 The 1977 Corvette set another new sales record at 49,213 units. 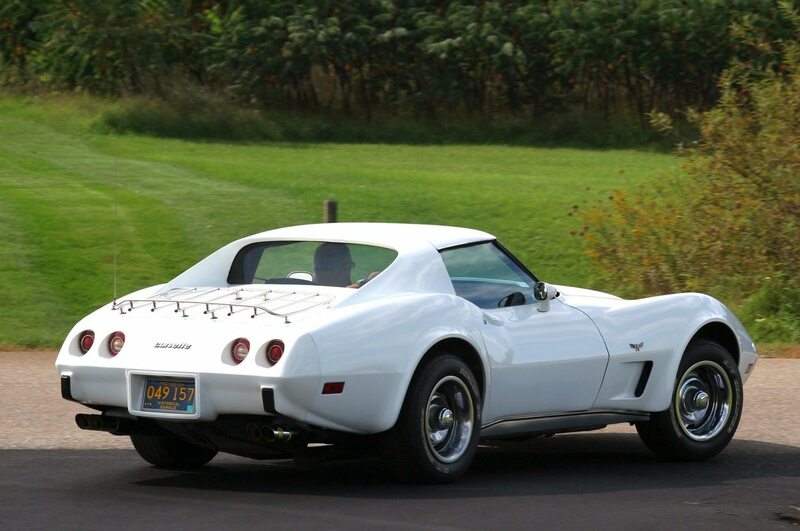 The popularity of the Chevy Corvette throughout the 1970’s was proven time and again by the year over year increase in sales numbers despite the dramatic increases in cost. 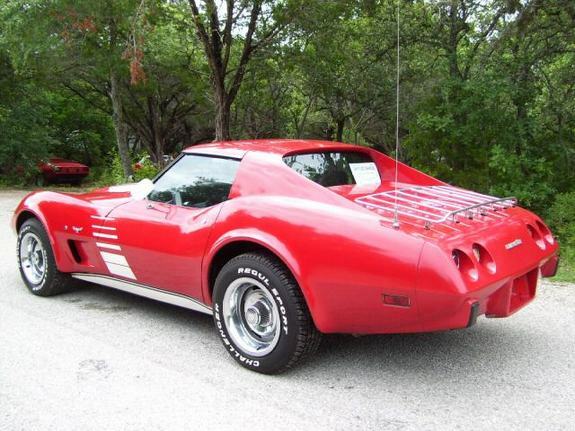 In 1974, the base sticker price of the Corvette had crossed the $6,000 barrier for the first time (it was actually $6,001.50). With each year, the price increase had been notable – $6,810.10 in 1975, $7,604.85 in 1976, and $8,647.65 in 1977, due to the inclusion of so many standard comfort and convenience features. 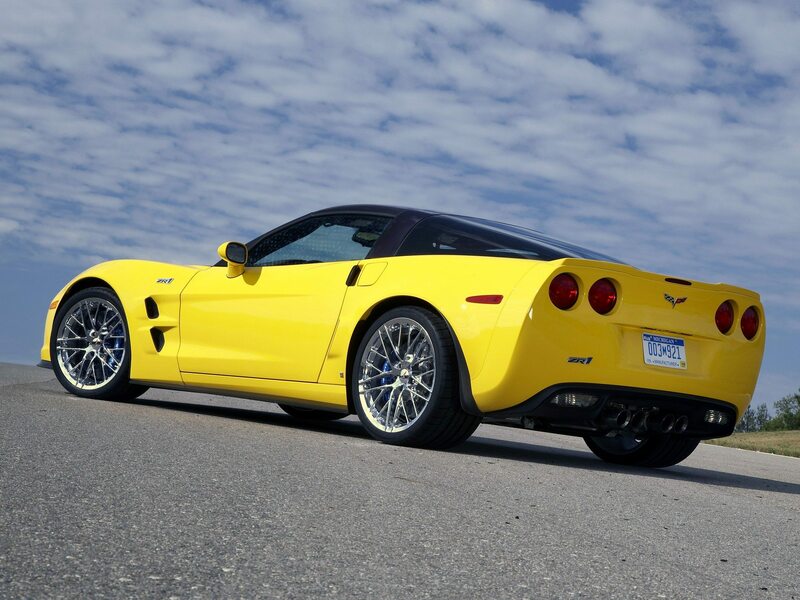 Despite this, there was no question that the popularity of the Corvette was still on the rise – which was doubly amazing (though not surprising) given that the C3 Corvette was a decade old. CARBURETOR NUMBERS: ROCHESTER Q-jet #17057202: 350 C.I., 180HP, AUTOMATIC TRANS. ROCHESTER Q-jet #17057203: 350 C.I., 180HP, MANUAL TRANS. ROCHESTER Q-jet #17057210: 350 C.I., 210HP, AUTOMATIC TRANS. ROCHESTER Q-jet #17057211: 350 C.I., 210HP, MANUAL TRANS. 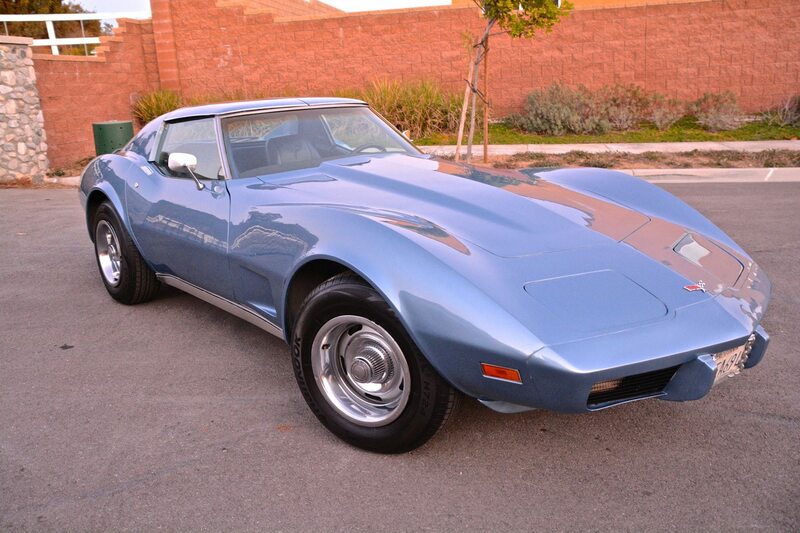 The last six digits begin at 400001 and run thru 449213, accounting for 49,213 Corvette Coupes built in 1977. Each Vehicle Identification Number (VIN) is unique to an individual car. 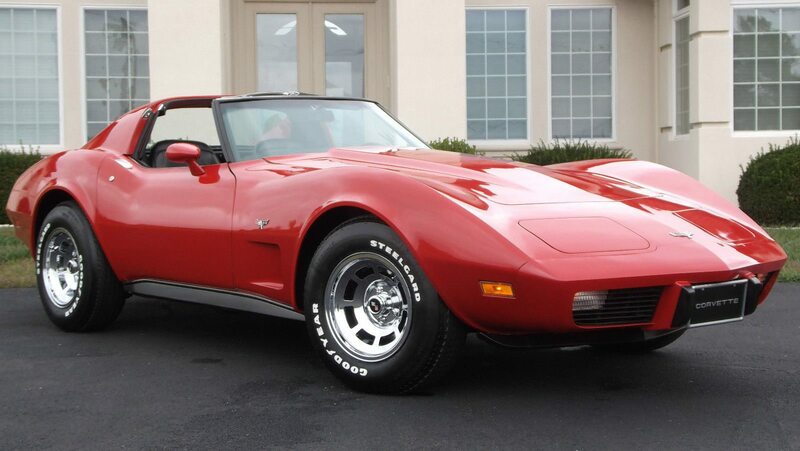 For all 1977 Corvettes, the location of the Vehicle Identification Number (VIN) is stamped on a plate attached to the left front body hinge pillar. 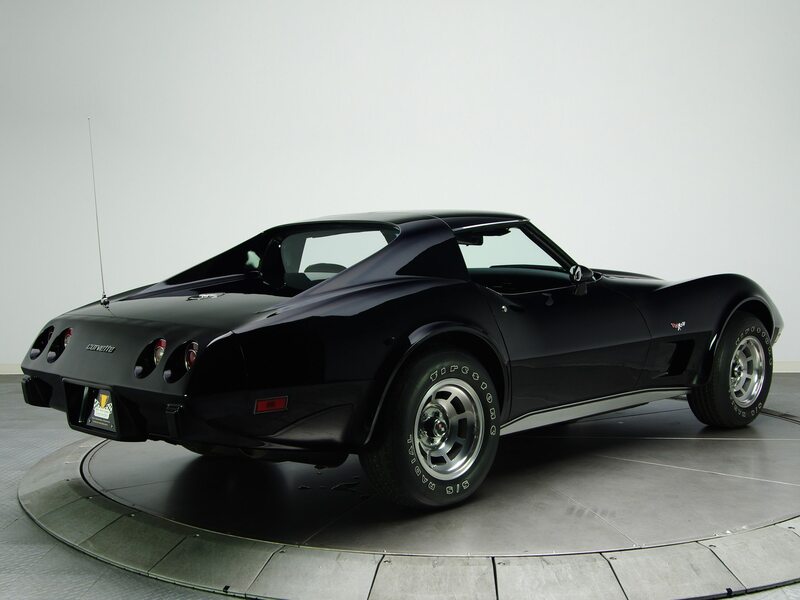 The base price of the 1977 Chevrolet Corvette Coupe without any optional equipment. A 350 cubic inch, 180 horsepower engine, 4-speed wide ratio manual transmission, leather interior trim, and T-tops were included in the base price. Leather seats were standard for the first time in 1977, but a cloth-leather combination could be substituted at no additional cost. The only engine-transmission combination available in California was the base 350 cubic-inch, 180 horsepower engine with the Turbo Hydra-Matic Automatic Transmission. Floor mats colored to match the vehicle’s interior trim coloring. Outside mirror assembly that included a mechanical linkage to control movement from inside the cockpit. The Gymkhana rear leaf springs contained 9 leafs, though the top leaf is very small. GM identifies the rear leaf springs as an 8-leaf spring. A selection of optional rear axle ratios. An early version of (what is commonly known today as) cruise control. The speed control option required an automatic transmission. The M40 Turbo Hydra-Matic Automatic Transmission was a no-cost option with the base 350 cubic inch, 180 horsepower engine, but cost $146.00 with the optional L82 engine. Alternate emission equipment installed for vehicles operating at high altitudes. The high-altitude emission equipment was required for vehicle operation at +4,000 feet. It was only available with the base 350 cubic inch, 180 horsepower engine and M40 transmission. A new steering column positioned the steering wheel two inches closer to the instrument panel to provide more of an “arms out” driving position, and easier entry and exit. 1977 models without option N37 were equipped with 1976 style steering wheels. 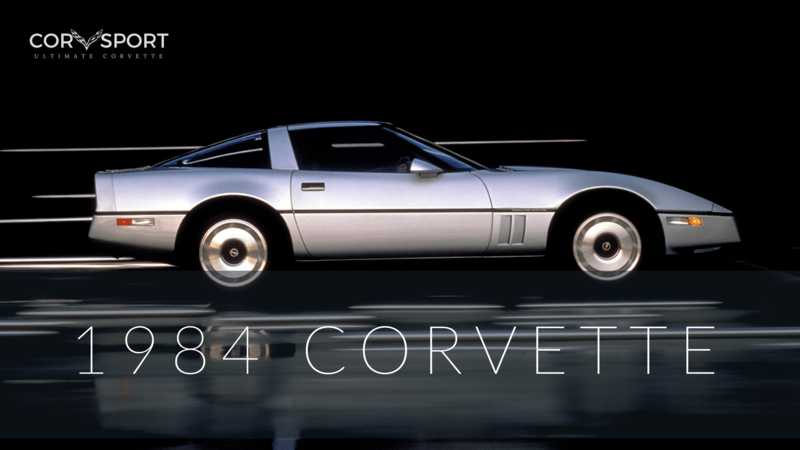 In 1977, 1248 Corvettes were ordered without a radio. Externally mounted roof and luggage storage rack on the rear decklid of the car. The trailer package included the Gymkhana Suspension, a higher-amp alternator and a heavy-duty radiator. The hitch was the standard, factory installed hitch available in 1977. The hitch could support approximately 100 pounds of tongue weight. 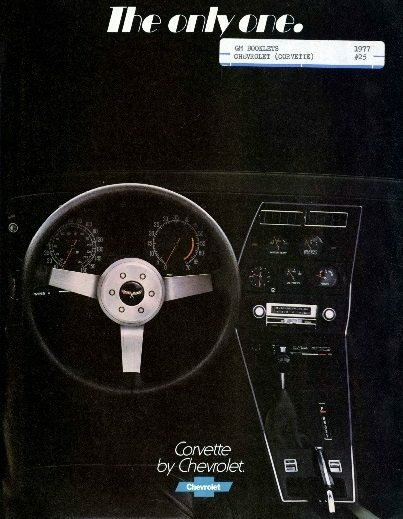 A group of convenience options available to consumers when purchasing a 1977 Corvette. The ZX2 Convenience Group included the dome light delay, headlight warning buzzer, underhood light, low fuel warning light, interior courtesy lights, and the passenger side visor mirror. Early in production, the low-fuel warning light wasn’t available, so Chevrolet deleted it and reduced the cost of the option to $18.00. Quantity of low-fuel light deletes was 3,881. A new console held heater and air conditioning controls and accepted standard Delco radios due to its increased depth. Early 1977 option listings contained CC1 glass roof panels ($200.00) but these were never available during the 1977 model year due to a marketing exclusivity dispute between Chevrolet and the panel vendor. Effective with 1Z37X7S427373, the alarm activator was moved from the driver-side fender to the driver-side door lock. 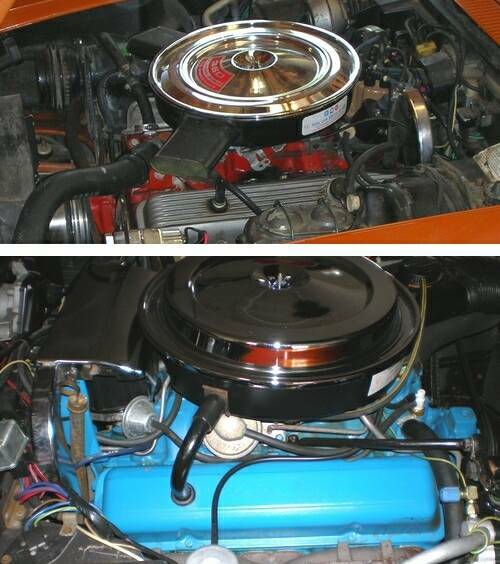 Between August 23 and September 7, 1976, Flint Engine changed from orange paint to blue when painting the Corvette engine blocks. As such, early 1977 Corvette engine blocks were orange while later production engines were blue. The headlight dimmer and windshield wiper/washer controls were located on the steering column stalks. Sunshades were redesigned to permit swinging to the side windows. The interior rearview mirror mounting point was relocated from above the windshield to the windshield itself. REMANUFACTURERD REAR BRAKE CALIPERS, PART NOS. 18-7019, 18-7020, 16-7019, AND 16-7020, MANUFACTURED FROM FEBRUARY 1, 2002, TO APRIL, 25, 2003., AND FOR USE ON 1965 THRU 1982 CHEVROLET CORVETTES. THE SUBJECT BRAKE CALIPERS WERE MANUFACTURED USING IMPROPERLY MANUFACTURED PISTON SEALS. THESE SEALS ARE INTENDED TO PREVENT FLUID LEAKAGE BETWEEN THE CALIPER HOUSING AND THE PISTONS. THESE BRAKE CALIPERS ARE FOR USE ONLY ON 1965 THRU 1982 CHEVROLET CORVETTE VEHICLES. THIS RECALL DOES NOT INVOLVE GENERAL MOTORS CORPORATION OR ANY OF ITS PRODUCTS. ALSO, CUSTOMERS CAN CONTACT THE NATIONAL HIGHWAY TRAFFIC SAFETY ADMINISTRATION¿S AUTO SAFETY HOTLINE AT 1-888-DASH-2-DOT (1-888-327-4236). THE INVOLVED VEHICLES HAVE STEERING WHEEL CENTER HUBS WHICH FAIL TO CONFORM TO FEDERAL MOTOR VEHICLE SAFETY STANDARD NO. 107, “REFLECTING SURFACES”. THE HORN BUTTON CAP AND THE LOCK LEVER HAVE A BRUSHED CHROME FINISH. THE SURFACE REFLECTIVITY OF THIS FINISH ON SOME OF THESE HORN BUTTON CAPS AND LOCK LEVERS IS APPROXIMATELY TWICE THE MAXIMUM REFLECTIVITY ALLOWED BY THE STANDARD. DEALER WILL REPLACE THE CAP AND LEVER WITH PARTS PAINTED TO MATCH THE INTERIOR TRIM COLOR AT NO COST TO OWNER. VEHICLE DESCRIPTION: PASSENGER VEHICLES EQUIPPED WITH TILT TELESCOPING STEERINGASSEMBLY.SYSTEM: STEERING; STEERING WHEEL CENTER HUB.CONSEQUENCES OF DEFECT: IF THE DRIVER DOES NOT TAKE STEPS TO ALLEVIATE THE DISTRACTION OF LIGHT REFLECTING OFF THE STEERING WHEEL HUB, THIS COULD LEAD TOAN ACCIDENT. See emission label on vehicle. Set engine for adjustments. Set ignition timing. For carburetors without solenoid and with air conditioner off, turn idle speed screw to set curb idle speed to specifications. For carburetors with solenoid, energize the solenoid, disconnect the air conditioner at the compressor, turn air condition on, set A/T in drive, M/T in neutral and turn solenoid screw to adjust speed to specified RPM. Use choke valve measuring gage J-26701. Rotate degree scale of tool until zero is opposite pointer. With choke completely closed place magnet squarely on top of choke valve. Rotate bubble until it is centered. Rotate scale so that number of degrees specified in opposite pointer. Place cam follower on second step of cam next to high step. Close choke by pushing upward on choke coil lever. To adjust, bend tang on fast idle cam until bubble is centered. Remove gage. The air pump is a two-vane pump which compresses fresh filtered air and injects it into the exhaust manifold. The pump consists of: a housing, centrifugal filter, set of vanes that rotate about the centerline of pump housing bore, the rotor, and the seals for the vanes. The centrifugal filter is replaced by first removing the drive belt and pump pulley; then pulling filter off with pliers. Care should be taken to prevent fragments from entering the air intake hole. NOTE: A new filter may squeal when first put into operation. Additionally, GREAT CARE should be taken in working on the compressor as the aluminum used is quite soft and thin. The air pump is operating satisfactorily when the air flow from it increases as engine speed increases. Raise the vehicle and remove the rear wheels. Loosen the equalizer check nuts until the levers move freely to the “off” position with slack in the cables. Turn the disc until the adjusting screw is visible through the hole in the disc. Insert a screwdriver and tighten the adjusting screw by moving the screwdriver handle upward. Adjust both sides. Tighten until the disc will not move, then back off six to eight notches. Install the wheels and place the brake handle in the applied position – 13 notches. Tighten the check nuts until an 80 pound pull is required to pull the handle into the fourteenth notch. Torque the check nuts to70in. lbs. With the hand brake off, there should be no dragon either of the rear wheels. 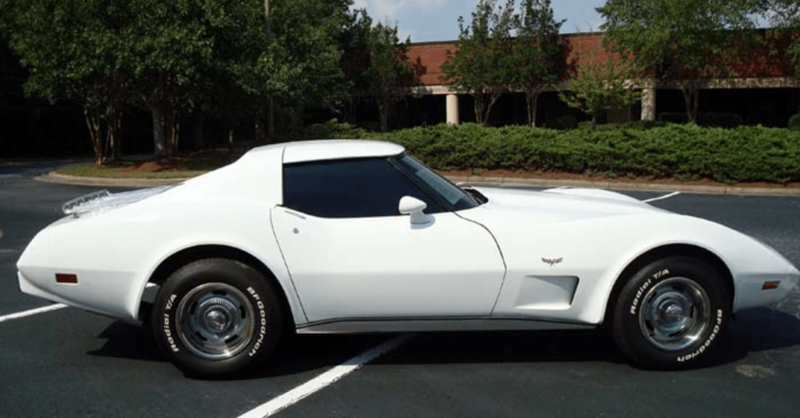 Download this 1977 Corvette Dealers Sales Brochure for a quick look at the features of the car.